Hi! My name is Courtney O’Reilly and I am the 2016 recipient of the Timothy J. Penny Federal Public Service Fellowship. This summer I am living in Washington D.C. and working as a legislative intern on Capitol Hill in Senator Al Franken’s Office. This spring as I was preparing for my summer in D.C., I tried to anticipate what type of work I would be doing. I expected to do numerous administrative tasks such as sorting mail, giving tours of the Capitol and getting coffee. While I still sort mail and give Capitol tours, I’m often assigned tasks such as policy research, fact checking, and taking notes at briefings. A top priority for this office is the professional development of each intern which is achieved in one way by allowing us to do substantive work and help with real projects. I think I might be leaving with more questions than I came with because I am realizing there is just so much more to learn than I ever thought! In Senator Franken’s office, each intern gets paired with Legislative Aides that have similar policy interests. These Legislative Aids have been excellent mentors thus far, and have given me the opportunity to broaden my horizons and find interest in policy areas I didn’t think I would be interested in. While I’ve learned a lot, I think I might be leaving with more questions than I came with because I am realizing there is just so much more to learn than I ever thought! This internship has taught me more than I could ever learn in a classroom and has prepared me to work in a professional setting once I graduate in the spring. Oh, and I also have yet to go on the expected intern coffee run! Another highlight of this summer has been living in Washington DC. Each weekend there museums to visit, cultural events to take part in, and other popular sights to see. So far my favorites have been the Newseum, which follows the history of the free press in the United States, and the Monuments on the National Mall because they are open 24/7 and are incredibly inspiring when you want to go on an evening walk after all of the museums are closed. This summer I am living in an apartment with five other girls. We all intern with different departments of the U.S. government and are all from different parts of the country. It has been very exciting to come home each day and hear about one another’s day because they are all so different. It truly has been a eye opening experience getting out of Minnesota for the summer to become a more well-rounded individual. 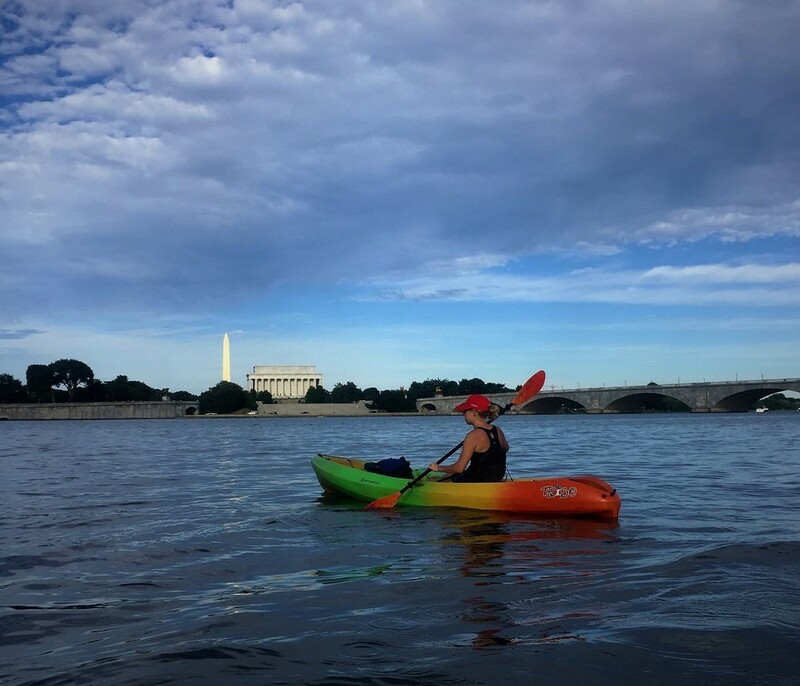 Trying to mix my love of Minnesota lake life with the views of DC – Here I am kayaking down the Potomac River. Finally, I would just like to send a huge thank you to the Penny Program Board. Their support has helped me to pay for essentials like housing and transportation without having to get a second job. This has allowed me to focus on my internship, make strong connections with those in my office, and help the Senator serve the people of Minnesota. I am forever grateful for their support and cannot wait to see where this experience will lead me next! If you have any questions about the Penny Program please contact our Director of Alumni and Programs Outreach Carlee Diggins.